Ankle injuries are among the most common injuries in all of sports, but ankle injuries aren't limited to athletes alone. Painful arthritis, edema, accidental trips, falls, and twists can all lead to painful ankle injuries. That's why National Brace and Splint offers a variety of ankle brace and support options to treat ankle injuries and chronic ankle pain associated with a variety of different conditions. Whether you are an individual looking for an ankle splint or a physical therapist seeking to fill out your inventory of ankle braces for patients, National Brace and Splint has all of the ankle support options that you're looking for. The ankle may be the most used joint and the active person's body. With every step we take, the ankle endures the flex of our feet, the weight of our body, and the strain of our imbalance. It is all too easy to sprain or strain the muscles in the ankle simply by taking a bad step. Ankle injuries become increasingly common as people grow older and begin to lose their balance. Ankle injuries are also common in sports that involve running, jumping, and/or a great deal of physical contact. In fact, many coaches of athletic teams require their players to wear ankle braces as part of their uniform in order to prevent ankle injuries. This is a common practice among volleyball teams, basketball teams, and tennis players. Once an ankle has been injured, reinjuring it can happen very easily. That's why it's always a good idea to treat an injured ankle quickly and effectively with an appropriate ankle brace or ankle splint. An ankle brace can help reduce pain, provide stabilization and support, and reduce swelling and bruising after a sprain or strain. A flexible ankle brace can also be effective in alleviating the pain associated with ankle arthritis or edema. Consult a doctor or a physical therapist to choose the right ankle support for your needs. If you're looking for an ankle support option that provides mobility and flexibility, an ankle wrap or sleeve might be the right option for you. 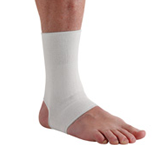 National Brace and Splint carries a variety of ankle wraps that can be applied on an as-needed basis to reduce pain and swelling and limit the range of motion of the ankle. Most ankle wraps and sleeves are highly flexible, only slightly limiting the mobility of the ankle. Instead, these ankle support systems provide a moderate level of additional stability and a dose of compression that can help reduce the pain of a minor sprain, moderate arthritis, or other minor ankle injury. After an injury, ankle sleeves can provide support that is lightweight and flexible enough to fit inside most shoes, even non-athletic shoes. Ankle stirrups are a form of ankle support that provides a higher level of stability than ankle wraps. Ankle stirrups can be used as a preventative measure against rolls and sprains or they can be used to help support the ankle after an injury has occurred. Ankle stirrups can also help improve balance and reduce the pain associated with arthritis and edema. They can help reduce pain and swelling after a sprain or strain has occurred, and help prevent any further injuries from taking places. Many athletes use ankle stirrups because, while they stabilize the ankle in a vertical manner, they don't limit an athlete’s ability to make sports-oriented movements, making stirrups a great choice for ankle support during physical activities. Ankle lace-ups provide an even higher level of support than ankle stirrups. Ankle lace-ups typically extend from the mid-foot up to the bottom of the calf. Lace-ups, as the name implies, can be laced as tightly or loosely as necessary to either completely limit the mobility of the ankle or allow a modicum of flexibility. Ankle lace-ups are a good choice for giving the ankle a heavy dose of support and stability after an injury. They can also be an excellent choice for athletes at high risk of ankle injuries such as ice skaters or football players. Ankle lace-ups come in a variety of sizes and styles to offer support to a wide range of individuals. 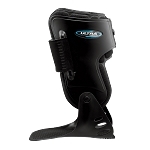 Hinged ankle braces are another ankle support system that offers maximum support to injured or weak ankles. 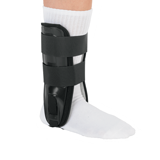 Unlike ankle lace-ups, a hinged ankle support has a hinge between the upper and lower portion of the brace, allowing for slight flexibility of the foot while maintaining a stable upright position in the ankle. 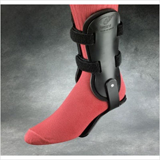 This very stable ankle splint can be used to support the ankle after a severe sprain as well as in cases of significant ankle arthritis or edema. Hinged ankle braces are also an excellent ankle support choice for athletes and other individuals who are experiencing significant swelling or pain in their ankle following a fall, twist, or sprain. When choosing the right ankle brace or ankle splint for your needs, it's a good idea to consult a doctor regarding which type of ankle support system will be best for you. If you're looking for an ankle brace for preventative means, you can always refer to the advice of a physical therapist or a sports therapist to make the best choice. 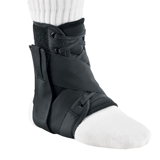 Doctors and other medical practitioners looking to buy ankle brace options in bulk can call National Brace and Splint at 888-774-1133 between the hours of 8 AM and 5 PM, Monday through Friday to speak to an experienced orthopedic supply expert. The company's top-notch service representatives will be able to answer all your questions regarding all of National Brace and Splint's most popular ankle brace options. National Brace and Splint offers all of the company's orthopedic and podiatry supplies at discounted rates without sacrificing customer service or quality of products. The company also offers fast shipping speeds at low prices. Find out why so many medical professionals turn to National Brace and Splint for their orthopedic supplies by calling today.